کاویانی چراتی, شهرام, سیاهکوهی, حمیدرضا, غلامی, علی. (1395). برآورد ضریب جذب داده‌های لرزه‌ای به کمک تحلیل زمان - بسامد براساس منظم‌سازی شکل‌ده. مجله ژئوفیزیک ایران, 10(3), 1-10. شهرام کاویانی چراتی; حمیدرضا سیاهکوهی; علی غلامی. "برآورد ضریب جذب داده‌های لرزه‌ای به کمک تحلیل زمان - بسامد براساس منظم‌سازی شکل‌ده". 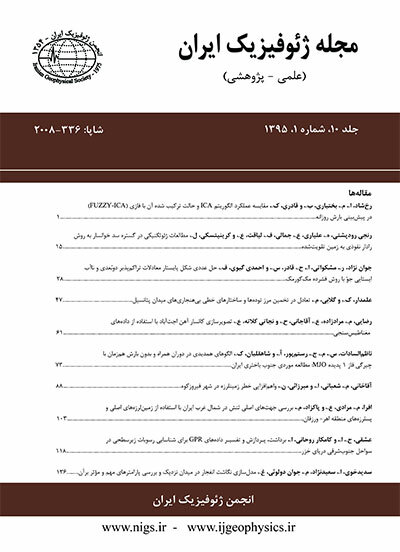 مجله ژئوفیزیک ایران, 10, 3, 1395, 1-10. کاویانی چراتی, شهرام, سیاهکوهی, حمیدرضا, غلامی, علی. (1395). 'برآورد ضریب جذب داده‌های لرزه‌ای به کمک تحلیل زمان - بسامد براساس منظم‌سازی شکل‌ده', مجله ژئوفیزیک ایران, 10(3), pp. 1-10. کاویانی چراتی, شهرام, سیاهکوهی, حمیدرضا, غلامی, علی. برآورد ضریب جذب داده‌های لرزه‌ای به کمک تحلیل زمان - بسامد براساس منظم‌سازی شکل‌ده. مجله ژئوفیزیک ایران, 1395; 10(3): 1-10. تحلیل‌ زمان- بسامد داده‌های لرزه‌ای به‌دلیل ناایستا بودن آنها، یک روش مهم در پردازش و تفسیر داده‌ لرزه‌ای است. دانستن اینکه چگونه محتوای بسامدی یک سیگنال با زمان تغییر می‌کند، مهم است، چرا‌که امکان تعیین بسامد قله (بسامد با بیشینه دامنه) محلی داده‌های لرزه‌ای ‌را فراهم می‌سازد. در این مقاله روشی برای انجام تبدیل زمان- بسامد به‌صورت محلی و بر پایۀ مسائل وارون استفاده شده است، که نیاز به انتخاب پنجره زمانی را برطرف می‌کند. از آنجایی که حل مسائل وارون همواره همراه با نایکتایی و ناپایداری است، در این مطالعه از روش منظم‌سازی شکل‌ده که یک منظم‌سازی درجه دو است، برای نمایش سیگنال لرزه‌ای ناایستا در حوزه زمان- بسامد استفاده می‌شود. تبدیل مورد نظر در این مطالعه بر پایه تبدیل فوریه می‌باشد و ضرایب فوریه به‌کمک روش‌ وارون تعیین می‌شود که در آن شعاع هموارسازی، عامل کنترل‌کنندۀ منظم‌سازی شکل‌ده می‌باشد. ایدۀ کلیدی در این روش این است که خطای میان سیگنال ورودی و همۀ مؤلفه‌های فوریه سیگنال ورودی را به‌‌طور هم‌زمان و با کنترل تفکیک‌پذیری زمانی، کاهش می‌دهد و این کار سبب نمایش هموارتری در حوزه زمان- بسامد می‌شود. کارایی روش با اعمال آن روی داده‌های لرزه‌ای مصنوعی و واقعی مورد بررسی قرار گرفت و به‌عنوان کاربرد لرزه‌ای از این روش برای برآورد ضریب جذب به کمک تعیین جابه‌جایی مرکز ثقل بسامد در داده‌های لرزه‌ای استفاده شده است. Time-frequency analysis is an important technique in the seismic data involving nonstationary signal processing and interpretation. Due to the limitations of the Fourier transform in analyzing nonstationary signals, it cannot be used for time-frequency representation. Time-frequency transforms such as short-time Fourier transform, wavelet transform and S-transform are common tools in the study of nonstationary characteristics in the seismic data. Based on regularized least-squares inversion, Liu et al. (2009) have recently proposed a new method of time-varying frequency characterization of nonstationary seismic signals. In this paper, we applied the method of Liu et al. (2009) by designing an invertible nonstationary time-frequency transform called local time-frequency (LTF) transform (Liu and Fomel, 2010). This method generates time-frequency characterization without sliding windows. The LTF transform aims at depicting the nonstationary character of seismic data. This transform uses a Fourier basis to match the target signal under the regularized least-squares norm and provided an invertible time-frequency representation where are the Fourier coefficients and . The use of a non-stationary regression makes it possible for the coefficients to vary with x. In the linear case, they can be obtained by solving the least-squares problem: The solution where denotes the least-squares estimate of m and LT denotes the adjoint operator and S is a smoothing (shaping) operator, was introduced by Fomel (2007) using shaping regularization. The λ scaling in this solution controls the relative scaling of the forward operator L. The key idea is to minimize the error between the input signal and all of its Fourier components simultaneously using a regularized nonstationary regression (Fomel, 2009) with control on time resolution. The transform can provide LTF representations for common seismic data interpretation tasks such as Q factor estimation. Seismic waves lose energy by traveling through the earth due to a variety of phenomena such as attenuation. Attenuation refers to the loss of energy caused by phenomena other than geometrical spreading, and depends on the characteristics of the transmitting medium. Generally, attenuation is expressed in terms of quality factor (Q) which is a dimensionless parameter and is inversely proportional to attenuation coefficient. Experiments show that the quality factor is controlled by the elastic properties of formation and its fluid content. Hence, as one of the most important attributes in seismic exploration, it is used to directly identify hydrocarbon reserves on seismic sections (Hedlin et al., 2001). In this paper, we present a procedure using the differences in seismic reflection time-frequency spectra to estimate relative seismic attenuation in a reservoir of carbonate rock with fractures and voids. It is difficult to determine the seismic reflections at the top and bottom of the reservoir, required by the conventional amplitude ratio and the frequency spectra ratio methods. But in this study, we use the difference of seismic reflection time-frequency coefficients to estimate the relative seismic attenuation in such reservoirs. Gu and Stewart (2006) considered a special case where the incident spectrum has a Gaussian distribution, and discussed the reflection centroid of frequency downshift. Here, we give the analytical expression of the differences of reflection spectra corresponding to two frequencies with an attenuation coefficient. We show that the differences of reflection spectra corresponding to the two frequencies that are symmetrical to the centroid of frequency and separated by twice the incident signal’s standard deviation can be used to calculate the attenuation coefficient. As a time-frequency representation tool, the LTF transform of Fomel et al. (2010) is used to study seismic wave attenuation coefficient in synthetic and real field data examples. روشندل­، ا.، 1388­، بهبود تبدیل­های زمان­- فرکانس در مطالعه داده­های لرزه­ای­: رساله دکتری، مؤسسه ژئوفیزیک، دانشگاه تهران­. غلامی، ع.، 1388، منظم­سازی مسائل بدوضع ژئوفیزیکی بر مبنای تُنُکی: رساله دکتری، مؤسسه ژئوفیزیک، دانشگاه تهران. کرمی مزین، د.، 1388، محاسبۀ تضعیف لرزه­ای نسبی با استفاده از اختلاف زمان­-فرکانسی بازتابی: پایان­نامه کارشناسی ارشد، واحد علوم و تحقیقات، دانشگاه آزاد اسلامی. Fomel, S., 2007, Shaping regularization in geophysical-estimation problems: Geophysics, 72(2), R29–R36. ——, 2007b, Local seismic attributes: Geophysics, 72(3), A29–A33. Gu, H., and Stewart, R., 2006, Calculation of relative seismic attenuation from the reflection time-frequency differences in a carbonate reservoir: Crewes Research Report, 18, Ch. 55. Hedlin , K., Mewhort, L., and Margrave, G., 2001, Delineation of steam flood using seismic attenuation: 71st Annual International Meeting, SEG, Expanded Abstracts, 1572–1575. Liu, G., Fomel, S. and Chen, X., 2009, Time-frequency characterization of seismic data using local attributes: 79th Annual International Meeting, SEG, Expanded Abstracts, 1825–1829. Liu, Y., and Fomel, S., 2010, Local time-frequency transform and its application to ground-roll noise attenuation: 80th Annual International Meeting, SEG, Expanded Abstracts, 3711–3716. Parra, J. O., and Hacket, C., 2002, Wave attenuation attributes as flow unit indicators: The Leading Edge, 21, 564–572. Pujol, J., 2003, Elastic Wave Propagation and Generation in Seismology: Cambridge University Press, Cambridge, United Kingdom. Quan, Y. L., and Jerry, M. H., 1997, Seismic attenuation tomography using the frequency shift method: Geophysics, 62, 895–905. Sinha, S., Routh, P. S., and Anno, P., 2009, Instantaneous spectral attributes using scales in continuous wavelet transform: Geophysics, 74(2), WA137–WA142. Sinha, S., Routh, P. S., Anno, P., and Castagna, J. P., 2005, Spectral decomposition of seismic data with continuous-wavelet transform: Geophysics, 70(6), P19–P25. Stockwell, R. G., Mansinha, L., and Lowe, R. P., 1996, Localization of the complex spectrum: The S transform: IEEE Transactions on Signal Processing, 44(4), 998–1001. Tikhonov, A. N., 1963, Solution of incorrectly formulated problems and the regularization method: Soviet Mathematical Doklady, 4, 1035–1038. Tonn, R., 1991, The determination of the seismic quality factor Q from VSP data: A comparison of different computational methods: Geophysical Prospecting, 39(1), 1–27.